Once upon a time, long long ago, in a pre-texting era, a friend of mine called me up and said, “We’re going shopping tonight – I’ll pick you up at 2:30 a.m., OK?” Given that we were actually taking and not texting, I couldn’t just reply with a standard wide-eyed Emoji. Who goes shopping in the middle of the night? Turns out that I had never heard of Black Friday. It was an experience I’ll never forget, although often times I’d like to. Whether you’ll be fighting the masses on Black Friday, logging-in for Cyber Monday, or experiencing the adrenaline rush that goes along with picking up everything you need three minutes before stores close on the 24th, chances are that sometime, somewhere, you’ll be looking for the perfect gift for someone special. You know what makes a great gift for everyone? Tablets and e-Readers! Seriously. One gift, appropriate for ALL ages. DONE. If you really want to go the extra mile in terms of WOW-factor, you can learn how to access free Apps from the library before-hand so that you can get the device up and running as soon as they open it! That’s right – our digital library is always open, so you can borrow eBooks, movies, music, magazines and newspapers right on Christmas Day. All of this sounds pretty great, right? Well, it gets even better. 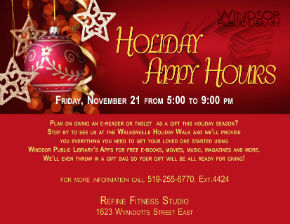 This Friday night (NOV 21) we’ll have a table set up at Refine Fitness Studio as part of the Walkerville Holiday Walk. Library staff will be available to talk about the different tablets and eReaders that are compatible with our collection, and to provide information and demonstrations on our Apps. We’ll even send you home with a gift bag and tissue paper – pretty much everything you need to present the perfect gift in the perfect way. No library card? No worries – we’ll be happy to make one for you on the spot. The Walkerville Holiday Walk is a great event to kick off the Holiday Season, and we hope to see you there. If you can’t make it, but still want to learn more about our Apps and eResources, consider attending one of our App Cafe sessions in December or January. Feel free to send your loved ones our way for hands-on help as well.